Once everything is settle after Christmas. 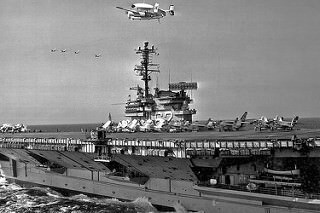 Then I will start on my last Supercarrier CVA-62 Independence.She will be in 1966-1967 time. This will be my hardest project. The Trump Kitty Hawk hull is correct from the bottom to the hangar deck area. That hangar area has to be removed and rebuilt so that it would look like Forrestal class hull. The island very kindly made by Steve of ModelMonkey. Thanks again for that. That helps out a whole lot. So my Tonkin Gulf fleet continue to grow. Happy New Year Everyone! !!! After finishing my Tamiya 1/48 scale Tomcat I started working on my 1/350 Hancock again. It is meant to be an August 1945 version which is causing me quite some trouble due to an extremly bad resource situation. In addition to that the Trumpeter Tico kit I have leaves a lot to desire. It's rather basic and also requires a lot of putty and sanding. More updates on the America thread. I've gone and got the Arii 1/800 New Enterprise and I can conform that the post refit island is indeed 1/720 scale. Or at least, it measures the same as the old Revell 1/720 Island. All the old style island parts are still in the Arii 1/800 box, bar one. The base square that all the panels are glued onto, so you still can't build it without some scratchbuilding. Never mind. I bought it for parts anyway. I see Trumpy are planning a 1/700 CV-67, any idea when that will be out? Indy on hold until I get the America flightdeck. That's because I would use the same company to make Indy flight deck. Trying to finish both BigE and America at the same. I know that is not going to happened. But that is my goal. I have Dan at Out of the Box doing a flight deck for Ranger. I think that he hit a snag in available data. Hope the America deck is coming along. I plan on doing America in 1/700 scale. Update on BigE this weekend. Thanks John, good to hear from you! Hope you are still building!